New Ceres, a planet in the outer colonies, embraced the Age of Enlightenment nearly two hundred years ago and refused to let go. Refugees and opportunists come to New Ceres in search of new lives, escaping the conflicts of the interstellar war that has already destroyed Earth. 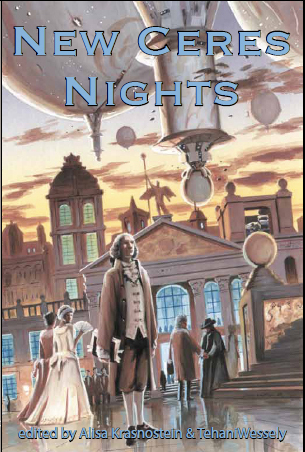 New Ceres Nights presents thirteen exciting stories of rebellion, debauchery, decadence, subterfuge and murder set against the backdrop of powdered wigs, coffee houses, duels and balls that is the shared world of New Ceres. New Ceres Nights was released in April 2009. While [the stories] share the same setting, each explores different aspects, and the result is a surprising variety…these were all strong offerings, and set in an inspired order, to gently introduce readers to the world’s quirks before they become important subtleties in later tales. … marvel that a story set a thousand years in the future, at a remove of many light years from Earth, and seeking to recapture an era two or three centuries before our own, can hold up such a mirror to our own mode of existence. Other New Ceres projects include Angel Rising (the first of the TPP Novella series, by Dirk Flinthart) and the New Ceres webzine. For more information about the New Ceres concept, visit http://ceres.dreamhosters.com/doku.php.